Disclosure: This post has been sponsored by KidKraft, but all thoughts, opinions, and photos are my own. On The Healthy Mouse, most of the time I talk about Disney-inspired recipes, baking, and food – my favorite topic! And since my daughter is often in the kitchen with me, she wants to cook too. She may be a bit too little to cook in a real kitchen, but I knew she would love a play kitchen so she could “cook” alongside me as I whip up delicious recipes for my readers! I wanted a kitchen that would go with the Disney decor in my house, and fit in my kitchen. I came across KidKraft’s Disney Jr. Minnie Mouse Vintage Play Kitchen, and knew this was the perfect fit for my daughter (she can’t get enough of Minnie Mouse). This vintage looking kitchen is full of polka dots and Minnie flair! I love that it is sturdy and wooden, incredibly high quality, yet still easy enough to move if you need to. This play kitchen has a stove, microwave, oven, refrigerator, cupboard, sink, and a phone. The works! We surprised my daughter with this Minnie Mouse play kitchen yesterday morning, and she immediately fell in love! I just love the little details, like the Minnie Mouse clock and the pretend water and ice machine on the fridge! 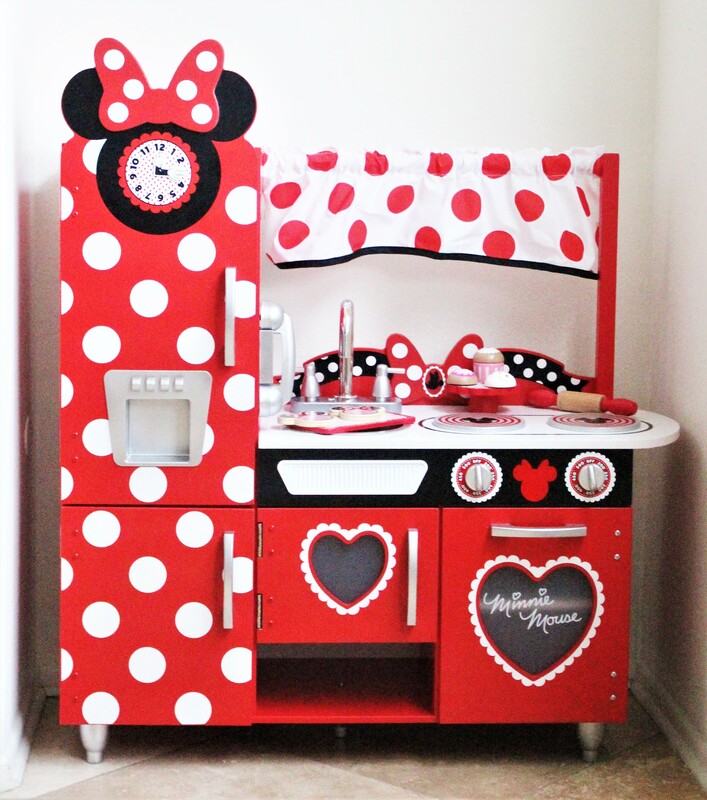 We also surprised her with the KidKraft Disney Jr. Minnie Mouse Baking & Treats set that matches the kitchen! It comes with a pretend mixing bowl, Minnie cookies, rolling pin, cookie sheet, cake stand, and cupcakes! She loves that it is full of Minnie Mouse style, and keeps pretending to talk on the kitchen phone to Minnie Mouse while baking Minnie treats! It’s definitely become her new favorite toy, and couldn’t be happier with how well it fits in with the Disney decor in our real kitchen! You can check out this play kitchen that is a must for any little Minnie Mouse fan on KidKraft’s site here.